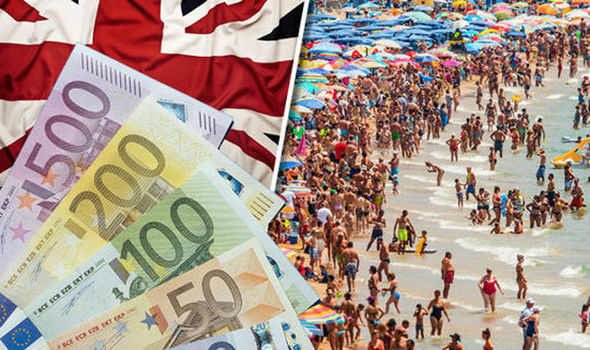 Since June 2016, sunbathing with a sangria has cost Brits more than it used to.Prices have not gone up around the world, it is just more expensive for us to pay them, and it is down to two things: Brexit and confidence. Global currency markets are pretty much run entirely on confidence. If people believe a country’s economy is going to improve, its currency strengthens, if not, it weakens, making it more expensive to buy things in someone else’s money. As soon as the Brexit referendum result was announced almost three years ago, sterling tumbled against major world currencies – the euro, dollar and others. Initially, sentiment turned against the UK currency as the vote to leave the European Union was unexpected by global market participants. Ever since, a failure to secure a deal (and the merry-go-round of politicians attempting to get one) has done nothing to inspire confidence around the world. This has meant UK travellers have needed to change more cash when going abroad to pay for their usual treats. But while this has meant cutting back on holiday spending, there has been an economic upside. Companies listed on the London Stock Exchange (LSE) issue their shares in sterling. For purchasers of these shares based outside of the UK, the drop in the strength of the currency acted as a bargain basement sale. It’s worth noting that while the exchange rate has dropped and remained low, the FTSE has risen and remained relatively stable. Prospective purchasers of UK shares with pockets full of sterling may not get this same price cut – but there are other opportunities to seek out. Many companies listed on the London Stock Exchange make their money in currencies other than the pound. Commodity producers – such as Glencore, Rio Tinto and BP – sell their wares in dollars, which means money coming in translates favourably into sterling, pushing up profits and, in turn, share prices. London has more international firms listed than any other major exchange – including more than 100 from the US – ranging from giant conglomerates to teeny-tiny, start-ups. In fact, some three quarters of earnings for FTSE 100 companies come from outside the UK. It is these internationally-focused companies that could drive up the FTSE in the short to medium term and could cushion the blow of a debilitated home currency for shareholders, as UK-based firms get to grips with a world outside the EU. So, should we remain locked in Brexit limbo for even longer, there is a way to make a weak pound work for you – just don’t expect it to work on the beach in Ibiza.